It’s Time D-Heads! This week we head on off to camp with none other than TESSA NETTING (Hazel on Disney’s Bunk’d, Billy Elliot on Broadway, YouTube Sensation)! 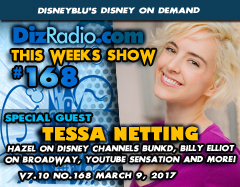 Tessa stops in and talks about being on the hit Disney Channel Show Bunk’d, her favorite episodes, memories, jokes and more. In addition she talks about her love of Harry Potter, Charities we works with and so much more! In addition no show is complete without the D-Team and Paige is here with the magic for your ears in the Magical Music Review and Domenic let’s the dogs out as he brings you an all-new Disney’s Short Leash. We have Cody taking a stroll on the Hollywood Walk with more about Tessa Netting. And you have the questions and Erin has the answers in I Want To Know. There is news fresh off the D-Wire with news on Pandora, Beauty and the Beast, Disney Channel, John Stamos, Disneyland, California Adventure, Food and Wine Festival, Chef Goofy, Star Wars, Avatar and more.